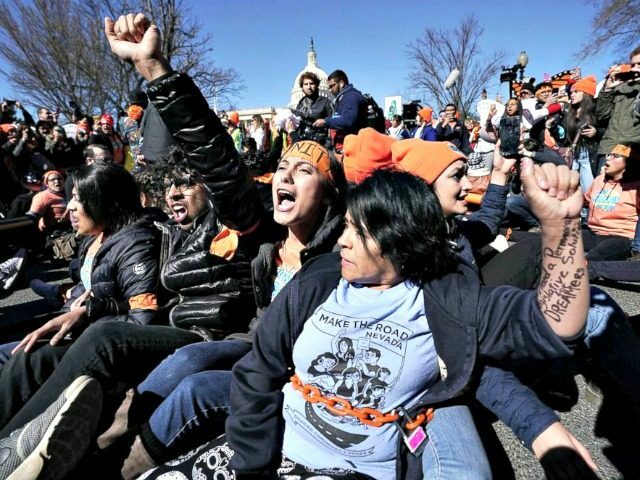 On Monday, DACA illegal aliens and open borders activists stormed Capitol Hill, demanding an amnesty for the 12 to 30 million illegal aliens living across the U.S. despite the negative impact it would have on America’s working and middle class. According to ABC News, 87 illegal aliens and activists were arrested by Capitol Police. Nearly 70 of the 87 arrests were made outside the Capitol, while 19 individuals were arrested inside the Capitol. All of those arrested were hit with obstruction charges and almost 30 of the activists were hit with additional resisting arrest charges. DACA illegal aliens and open borders activists with the billionaire George Soros-funded group “United We Dream” stormed the Capitol, saying that the millions of illegal aliens in the U.S. are entitled to an amnesty. We will not stop fighting for our community. Trump and racist politicians will not take our humanity and our joy away. We are #HereToFight! As Breitbart News reported, DACA illegal aliens and open borders activists blocked streets outside House Speaker Paul Ryan’s office in Racine, Wisconsin on Monday, demanding an immediate amnesty for illegal aliens. Ryan has been a supporter of amnesty, taking the big business position that immigration is good for keeping U.S. wages and labor cheap. Under a DACA amnesty, American taxpayers would be left with at least a $26 billion bill. About one in five DACA illegal aliens, after an amnesty, would end up on food stamps, while at least one in seven would go on Medicaid. Since DACA’s inception under Obama, more than 2,100 illegal aliens have been kicked off the program after it was revealed that they were either criminals or gang members. Also, as Breitbart News reported, only four percent of DACA illegal aliens have completed a college education, making the DACA population far less likely than the native American population to finish college with a degree. Another 25 percent of DACA illegal aliens, Breitbart News reported, are “functionally illiterate” in the English language, despite being touted by the open borders lobby as being highly-educated and highly-skilled. Most recently, a DACA illegal alien was arrested in Rochester, New York after allegedly threatening to shoot up a nearby high school, as Breitbart News reported. Likewise, in October 2017, a DACA illegal alien was arrested and charged with murdering a teenage girl in Greenville County, South Carolina. The illegal alien DACA recipient, Daniel De Jesus Rangel Sherrer, allegedly shot 18-year-old Diana Martinez-Gonzalez to death in a wooded area, according to police.